Governor Ralph Northam has declared a state of emergency in Charlottesville ahead of the one year anniversary of Unite the Right. The white supremacist rally held on August 12 last year left one person dead and another 30 wounded when James Field Jr drove his car into a group of counter-protestors. The announcement released earlier this afternoon stated, “These state of emergency declarations will enhance planning and cooperative response efforts that have been in development since March.” According to the statement, the declaration allows various state agencies to perform “actions outside of the scope of normal operations” as a way to make sure resources are available to both local government and residents. According to CBS 6, the Virginia State Police Superintendent has said that 700 state police will be activated in and around Charlottesville to prevent any incidents over the course of the weekend. 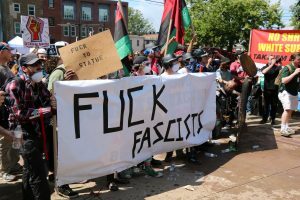 Last August, the city of Charlottesville and the Charlottesville Police Department took a hands-off approach to the event, which ended in street brawls, confrontations, and the eventual vehicular attack against counter-protestors. Charlottesville Police Chief Alfred Thomas resigned last December shortly after the release of a highly critical report that listed serious planning failures.The consultant hired to evaluate planning for the event, former U.S. Attorney Tim Heaphy, found that the city failed to both coordinate and communicate proper instructions in advance of the rally. The man behind the attack, James Fields, Jr. of Ohio, has been indicted on 30 charges including federal hate crimes, and is awaiting a November trial. Several memorial events have been planned this weekend in Charlottesville. Jason Kessler, the man who organized Unite the Right last August, will be holding another rally in Washington, DC on Sunday. 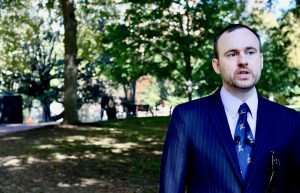 The National Park Service released a list of speakers who will headline the event which included, neo-Nazi Patrick Little, KKK Grand Wizard David Duke, Simon Roche, Kevin Cormier, Avialae Horton, and Corey Mahler. 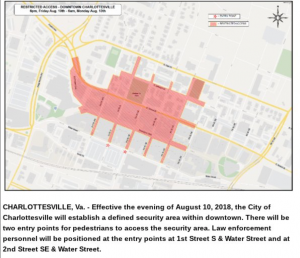 A map of the security planning for this weekend has been released by Solidarity Cville in a tweet just two hours ago. 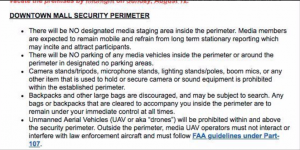 They also released a list of instructions indicating what is allowed and isn’t on the downtown mall over the course of the weekend. 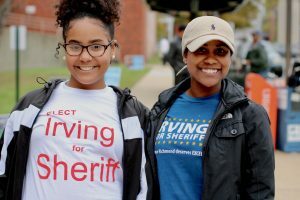 The Virginia government elections happened weeks ago, but it ain’t over yet. Here’s some frequently asked question to help explain what happened, and what to expect next. Virginia’s weird and arbitrary election schedule puts the election for Governor and some state offices in an “off-off-year.” Since the 2017 election was the first major political contest after Trump’s victory last fall, the entire country was watching to see how it might affect future elections. After a number of close races, the election ended with the GOP holding onto a slim majority at 51-49. However, some races are still undecided. Incumbent Republican Tim Hugo has a 105-vote lead on Donte Tanner in House District 40. Over in the 94th District, incumbent David Yancey has only a 10-vote (!) lead over Democratic challenger Shelly Simonds. The state Board of Elections has just certified the results of the last of these elections, so we can move on to the recount/challenge phase. The outcomes of these three contested elections will determine which party controls one of the houses of Virginia’s bicameral (two-house) legislature. 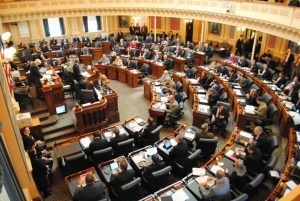 The House of Delegates has 100 members, and it’s been skewed heavily towards the GOP in past years – in 2017, it was 66 to 34 for the Republicans. Again, the GOP lead is now down to 51 to 49. And, if a single one of the three contested election results are reversed at any point, the house would be evenly divided. That’s happened at least once before in the chamber’s history, and both parties worked out a power-sharing arrangement, with co-Committee Chairs and shared speaker duties. Over in the Senate, legislators get four-year terms, so their next election isn’t until 2019. But that house also has just a narrow Republican majority, 21-19. So what can happen to change the GOP majority? Virginia state law allows losing candidates to request a recount, as long as they lost by less than 1% of the total votes cast. You don’t need a lot of math to realize that all three of the contested races fall within that margin. Still, Hugo and Thomas probably have little to worry about here; it’s unlikely that a recount will turn up enough miscounted or discounted votes to overcome their lead. The 2013 recount took place over two days in mid-December, so we’ll probably know the recount outcomes before the legislative session starts in January. Our endlessly inventive Virginia election laws also allow losing candidates to contest the election in the General Assembly. It’s not clear if this has ever happened before, so it’s hard to know exactly how this would proceed. But the state code allows for such a challenge to be overseen by the House’s Committee on Privileges and Elections. If the chamber remains Republican-controlled, it’s unlikely the contest will go anywhere. But under a power-sharing arrangement, things could get more interesting. Democrats will most likely look to the courts for the 28th district, where voters were assigned the wrong ballots. Still, only about 80 votes seem to be at question here. Surely not all of them voted Democratic, so it’s unlikely the Democrats could generate enough votes from these folks even if they were allowed to submit new ballots. The Democrats might instead try to get the original results thrown out and demand a special election. But they would have to find judges willing to interfere with election outcomes, which they are generally reluctant to do. The bottom line: these court challenges are less about the legal arguments made, and more about the politics of the situation. Will any Virginia judges be willing to wade into partisan politics and “overturn” an election? My guess is no, but we’ll see soon. One final method that the Democrats could use: Governor-Elect Ralph Northam has a lot of jobs to fill in his administration. Some Republicans are worried he could try to change the legislature’s math by offering plum spots to Republican Delegates or Senators. At the same time, the Governor has to be careful not to pull a legislator out of a weak Democratic district. 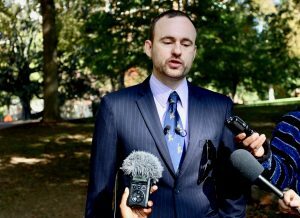 Northam’s transition team may not end up affecting this year’s legislature much. (His predecessor, Terry McAuliffe, only created one special election through appointment, and that wasn’t until August.) But remember that being a state legislator is only a part-time job; administration appointments can be lucrative, as well as allowing significant contributions to public service. Everyone will be eyeing the work of his transition team very closely. This is fascinating for political junkies, for sure. But there are real policy consequences stemming from partisan control. For example, Republicans have blocked Medicaid expansion for years; so 400,000 Virginians who could have health insurance should care greatly about which party runs the legislature. Laws covering reproductive rights, gun regulations, and the environment all depend on whether or not they can get through committees. So there’s a lot at stake. The next few weeks will determine what happens. Stay tuned. 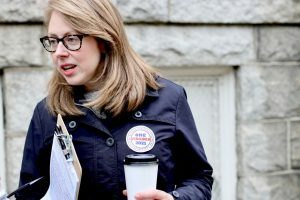 Tuesday’s election was a landslide victory for Democrats, taking all three statewide seats, along with potentially flipping the Republican-dominated General Assembly blue. In fact, Virginia Democrats have not had such a resounding victory since the late 19th Century. Yet, this victory is even more special given our current political age, one that is driven by fear of the “other,” suspicion of each other, and the kinds of overt racism and bigotry that drove Gillespie’s failed bid as the Commonwealth’s top executive. What yesterday proved to our communities in Virginia, the nation, and even the world is that decency can prevail even in the most tempestuous of political circumstances. That decency was on full display yesterday throughout Richmond. 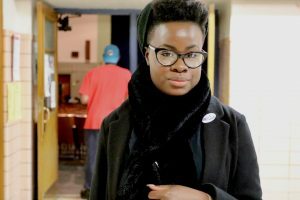 Our reporting team spent almost 15 hours on the beat at polling stations to take the vibe and atmosphere of what people were feeling throughout the River City. What we found were people committed to their communities and engaging wholeheartedly in their most sacred civic obligations, which (after November 2016) people can no longer take for granted. The range of political interests and policy motivations between communities, locations, and demographics varied, but one thing was clear, rejecting the divisiveness of fear that is trying to drive us apart was a priority for most citizens. 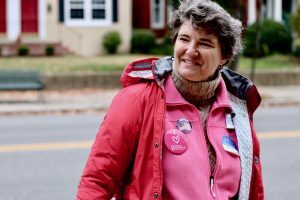 In this, Richmond was not unique, as the Commonwealth just elected the nation’s first transgender woman, Danica Roem, the first Asian American delegate, Kathy Tran; the first two female Latinx delegates, Hala Ayala and Elizabeth Guzman; and the second state-wide African American candidate, Justin Fairfax; along with a tidal wave of victories for first-time women candidates – just to name a few. That was the message that Virginia sent to the rest of the US yesterday, and Richmond has been on the front lines of the statewide debate that ushered in this progressive victory. 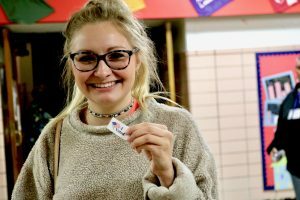 Here are some of RVA Mag’s most intimate campaign photos from polling places on Tuesday, a day which will be talked about and analyzed for years to come. Christopher, No Last Names Given. *Words and photos by Landon Shroder. 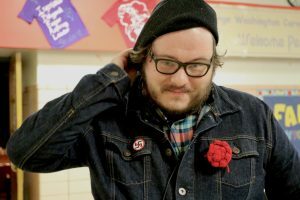 Cover photo of Christian from Ice Cream Support Group. In this year’s gubernatorial debates, Confederate monuments came up time and time again. Such a singular focus seems strange, considering that all the candidates in this election have essentially the same position on that issue – leave the decision up to local residents. But because it is a culture war issue, it commands attention. One candidate likes the monuments. Another does not. That tells us which team they are on in the ongoing culture war. Some people are passionate about Confederate monuments. I understand that. But what a shame that the topic has sucked up so much of the oxygen in the room, leaving little time for issues that much more directly impact the material well-being of Virginians on a daily basis. As a lawyer and a believer in the importance of freedom, choice, and of our constitutional and civil rights, I see criminal justice reform as one of the top priorities in the Commonwealth. However, the topic never came up in any of the debates. Have the monuments been pushed front and center to distract and divide us, to keep us from reaching a bipartisan consensus on urgently needed reforms in other areas? Virginia’s criminal justice system is unfortunately not very just and has many policies that are a legacy of an explicitly racist past, when state government enforced massive resistance to public school integration and banned interracial marriage. 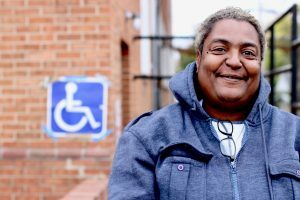 Its burdens weigh especially heavily on lower income Virginians and people of color, but all of us pay dearly — both through a loss of skilled workers and economic dynamism, and direct support of the system and affected families with taxpayer money. Each of us must come to terms with our association with an unjust and devastating system that shames us on a national level. Virginia’s criminal justice system fails most dramatically where success is most critical — for our children. 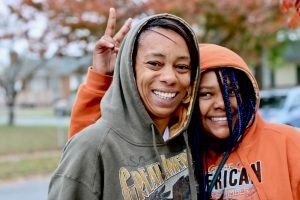 In a tragedy often referred to as Virginia’s “School-to-prison pipeline,” Virginia refers students to law enforcement agencies at the highest rate in the nation — nearly triple the national average, disproportionately black and disabled children. About half of criminal complaints are for children aged 14 and under. Schools are not required to report the reasons for the referrals, but anecdotal evidence abounds, with charges of “disorderly conduct” for behavior such as kicking a trash can. The Virginia Department of Corrections reports that we pay over $120,000 per year to keep a child in juvenile detention, even though we utilize large juvenile prisons with severely limited programs for rehabilitation and recidivism reduction. Rehabilitation and reintegration into society should be top priorities for juvenile facilities, because the human and financial cost of losing an entire lifetime to the criminal justice system is astronomical. But our failure in this area is staggering — 75 percent of youths leaving juvenile facilities are reconvicted within three years. While housed in these facilities, located over 100 miles away from Hampton Roads and Northern Virginia — our highest committing communities — youths pay $5 to $10 per phone call and earn 35 to 50 cents an hour in their institutional work program. Meanwhile, their families are forced to pay child support to the state to support the cost of their commitment. Community-based alternatives not only exist, but are used successfully in other states, where research has proven their effectiveness. Functional Family Therapy, a structured family‐based intervention that uses a multi‐step approach to enhance protective factors and reduce risk factors for the family; Aggression Replacement Training, which uses repetitive learning techniques to help offenders develop skills to control anger and use more appropriate behaviors; and Multi-Systemic Therapy, which improves families’ capacities to overcome the causes of delinquency by promoting parents’ ability to replace deviant peer relationships with pro‐social friendships; have each been shown to produce net benefits of tens of thousands of dollars per youth. 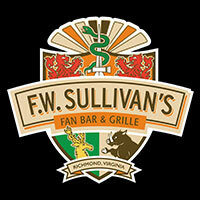 We need to bring those proven programs here to Virginia. Where secure facilities are necessary, they should be small, regionally-based, and focused on growth and rehabilitation under an independent ombudsman’s oversight. But reform needs to go well beyond our juvenile justice system. Too many Virginians are languishing in prison for victimless crimes like drug use, away from their families and away from any productive work. Virginia spends billions of dollars each year on a criminal justice system that arrests 40,000 Virginians for drug crimes every year, with marijuana arrests accounting for 60 percent of those and mere possession well over 80 percent. The direct cost to incarcerate one person is about $30,000 per year, not to mention the loss of their productivity to the economy and the loss of their tax dollars, the fracturing of their family, and all the negative economic consequences for their families and for their futures. Drug arrests disproportionately affect African American communities, even though research indicates drug use is no more prevalent there, and contribute substantially to the gaps we see between those communities and others in terms of educational outcomes and economic performance. The number of drug arrests in Virginia has skyrocketed over the last 10-15 years, almost doubling — even though rates of violent crime and property crime are dropping, and even though rates of drug arrests are also falling rapidly in other parts of the country. The Commonwealth has ordered a study into marijuana decriminalization, but do we really need a study? 29 states and the District of Columbia already have legalized marijuana. We know that it works. When marijuana is legalized, opioid deaths plummet and tax revenues soar. Surveys show that more than 85 percent of Virginians support some form of legal marijuana, and over 60 percent support full legalization. 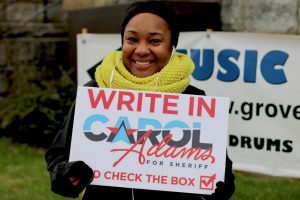 But because we have no ballot referendums here in Virginia, we are still waiting for action from a governor who cares about what the people of Virginia want. We don’t need a study, we need to stop wasting taxpayer money incarcerating productive citizens, separating them from their families and subjecting them to abuse, and depriving them of their ability to obtain stable and high paying jobs in the future. We need to legalize marijuana now. Although legalization requires cooperation of the legislature, the governor has the power to grant an absolute pardon to any Virginian who is in jail only for drug use, after completion of a treatment or anti-recidivism program (if deemed necessary), so they can return to their families, expunge their records, and get a good, stable job. And until marijuana is formally legalized, the governor can order law enforcement to give laws against drug use the lowest possible enforcement priority. That would allow us to dramatically cut the $3 Billion spent on the justice system each year and increase tax revenues while strengthening families and improving relationships between police and the communities they serve. Numerous other abusive criminal justice practices in Virginia should also be curbed. For example, arrest quotas should be made explicitly illegal, so that police officer promotion or awards cannot be predicated on making a certain number of arrests. The abusive suspension of driver’s licenses for failure to pay trivial fines and for minor drug offenses should end, to help keep at-risk Virginians employed. Civil asset forfeiture abuse, also known as “policing for profit,” is a common practice in Virginia whereby police can seize private property based merely on a suspicion that the property was related to criminal activity, without any criminal charge or conviction. Victims are forced to sue the police department to get their property back, a costly, time-consuming, and, for most victims, impractical process. A criminal charge should be required before property can be seized, proceeds should be sent to the general fund and not directly to the police, and property should be returned to the owner when a criminal conviction is not obtained. In Virginia, judges with little knowledge of the lives of the accused set bail levels at their own discretion and without relying on statistical evidence. Experiments with bail reform in other states have shown equal or better results in defendants showing up for trial, with much lower costs to the accused – many fewer poor people forced to stay in jail, sometimes for a year or more, just because they can’t afford bail. The felony larceny threshold should be increased from $200 (the lowest in the nation) to the national average of $1,000 or more. Studies show that low thresholds waste valuable resources without any benefit in crime reduction. Parole for non-violent offenders encourages rehabilitation and good behavior and reduces recidivism, and should be reinstated in Virginia. Restoration of voting rights should be made automatic after all sentences and probation are served, as in almost all other states. Trial by ambush should be ended, by requiring prosecutors to turn over police reports and other evidence to the defense before a trial. And, Virginia should implement the recommendations of the 2015 Governor’s Commission on criminal justice reform for improving our prison system, which could save Virginia $500 Million each year while improving effectiveness. All of these reforms are badly needed and would save the Commonwealth billions of dollars in direct and indirect costs while allowing law enforcement to focus on serious crimes. They would also rehabilitate our reputation and make our state fairer and more just for all its citizens. Shouldn’t the Governor make these reforms a priority? Only one candidate has made them a priority on the campaign trail — that’s me. The Las Vegas mass casualty attack – one of the deadliest in modern US history – has brought gun control to the forefront of Virginia’s gubernatorial race. Democratic nominee Ralph Northam has pushed for universal background checks and an assault weapons ban, while at the same time reinstating a former law limiting handgun purchases to one per month. Many gun control bills have been introduced in recent General Assembly sessions, but the Republican-controlled legislature consistently blocks efforts to add new restrictions on the purchase and possession of firearms. Perhaps it’s counterintuitive to say this, but for Virginia (and the country) gun control responses to mass casualty attacks are not true solutions. Gun regulation won’t solve a problem dependent on social and economic factors. Gun control only treats the symptoms, not the cause. You see, in most cases violence is a symptom of poverty. When you are poor, your opportunities to escape poverty are exceptionally limited. 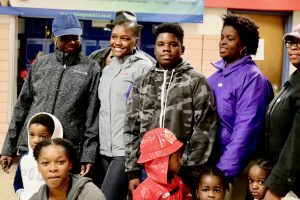 Richmond’s poverty rate among children is the second-highest in Virginia, and as recently as 2015, one in four Richmond residents lived in poverty. When poverty-stricken citizens need to pay rent, or feed their family, or just find the basic necessities, and there is nowhere else to turn, they turn to crime, and that can mean violence. Meaning stricter regulations for guns won’t resolve the underlying reasons behind many of the shootings in Virginia, Richmond, or even the rest of the country. So is gun control where we should focus our energy or should it just be more thoughts and prayers? Neither, I think they’re both equally ridiculous. The typical form of gun control means writing more criminal laws, therefore creating more criminals and more reasons for police to suspect people of crimes. More than that, it means creating yet more pretexts for the continued militarization of police. 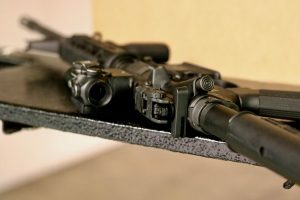 Searching for guns can easily become a stand-in for some general prediction of risk, danger, or lawlessness. In other words, police would use selective enforcement, where enforcement includes obtrusive searches based on existing prejudices about who is and isn’t dangerous (think stop and frisk). This is a problem, because the police already operate with barely constrained force in poor, minority neighborhoods ( hello Ferguson, Missouri). From police using military equipment in non-tactical situations,(hello Standing Rock), to stop-and-frisk, to mass incarceration, to parole monitoring; the police operate a cache of programs that subject these populations to several layers of coercion. As a consequence, more than seven million Americans are subject to some form of correctional control, an extremely disproportionate number of whom are from poor and minority communities. Following in stride with national trends, Virginia has an increasingly terrible record. People of color, particularly African Americans, are overrepresented at each stage of the Virginia criminal justice system. The Justice Policy Institute recently put out a report on the Commonwealth’s correctional systems highlighting this very thing. 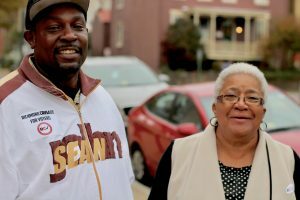 In Virginia, African Americans comprise roughly 20 percent of the adult population. In the justice system, however, they comprise: 47.4 percent of all arrests 76.2 percent of robbery arrests, 52.2 percent of aggravated assault arrests 60.8 percent of state prison inmates – for every white person incarcerated in Virginia, six African Americans remain behind bars. As a result, a yawning gap exists between the justification for gun control and its most likely effect. Based on history alone, there is no reason to expect fair enforcement of gun control laws. Why? Because how our society is policed depends not on the laws themselves, but on how the police – and the criminal justice system – decide to enforce those laws against their citizenry. Once more, think stop and frisk. And given that there are around 300 million guns in the US, any attempts at enforcing gun laws will be selective. That is to say, they will be unfairly enforced against poor and minority communities. For example, once individuals find themselves arrested, “gun control” typically appears as a reason for increasing punishment – enhancing sentences for other crimes in the process. Gun charges are also a part of the excessive and racially unequal over-charging practices that not only contribute to rising incarceration rates, but also forces individuals away from trial and into plea bargains – forcing them to accept what is still a significant period of incarceration without a trial, rather than risk disproportionately lengthy sentences for relatively minor offenses. 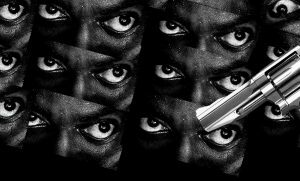 As the Washington Post reported in 2014, “47.3 percent of those convicted for federal gun crimes were black — a racial disparity larger than any other class of federal crimes, including drug crimes.” Indeed, for most communities of color, being the ”good guys with guns” can actually cause more harm than good. Look no further than Philando Castile, a gun owner who was killed by the Minnesota police, as an example. In Virginia and throughout the US, we should focus on the structural inequalities and material conditions that are at the root of these problems, instead of solely focusing on guns. Research shows that areas of the country experiencing the highest incidents of gun homicide are marked by intense poverty, low levels of education, and racial segregation. Again, violence is a symptom of poverty – it is time to treat the symptom. We can approach shootings as a criminal justice problem or as a public health and social welfare problem; that’s what is missing in the discussion after any mass shooting attack. Social inequality and income inequality are to a large extent fueling the gun violence in the country. Even Richmond is trying to combat its gun violence with a new targeted ad campaign, which is novel but still misses the point. If the city wants residents to respect Richmond? Maybe the residents need to be respected by the city first. Last week brought us the worst political ad in Virginia and it wasn’t Dan Helmer. Apologies to RVAMag’s Political Director. He’s totally right about all the ways Dan Helmer’s ad was a bad idea, it’s just that this ad is even worse. We now have the Republican candidate for Virginia Governor, Ed Gillespie to thank for this. 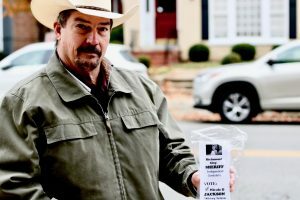 On September 20, Gillespie released an ad attacking his opponent, Democratic Lt. Governor Ralph Northam. We’re used to political attack ads here in Virginia. The last gubernatorial race was one of the ugliest in recent memory. So is this ad really so bad? 1. For starters, the “gang members” depicts in the ad are (1) not in Virginia, and (2) not even members of MS-13. 2. The campaign is using the photo in question without permission, just swiping it from an online Salvadoran newspaper. (In academia, we call that plagiarism.) Nevertheless, the campaign doubled-down by calling it “fair use”, which makes it seem like they’re performing a public service with their garbage campaign ad. 3. The ad ties gang violence to immigration, while most of the MS 13 violence has been committed by U.S. citizens – a fact that is known to most human rights organizations, while their core membership comprises only about one percent of all gang activity in the US – making this line of reasoning a red herring and racial dog whistle. 5. What we call “Sanctuary cities” are not actually a real thing. Different localities commit to different levels of cooperation with immigration authorities throughout the Commonwealth. It’s complicated, but this bill that Northam supposedly cast the deciding vote for was mostly political theater, and was eventually vetoed by the Governor. I’m not the only one noticing all this, obviously. The Northam campaign says that this ad shows just how desperate Gillespie is getting. They may be right. This ad essentially backs up what I said last week in a story I wrote for ABC 8: Gillespie is the underdog in this race. What’s more, this ad shows that he knows it. He’s pursuing a classic underdog strategy: (1) turn out your base by appealing to their bread-and-butter issues and/or, as in this case, their worst instincts; (2) go negative. And who knows? Maybe this is the best strategy, and one that might work; one lesson we learned last year is to never count out the appeal of racism for American voters. But it’s a pretty ugly strategy to watch unfold. Gillespie may or may not be desperate, but this ad represents the worst tendencies of his campaign and his party. It should make you think twice about what he’d be like in office.